Model: The Medion Erazer X7857 is a large and fast gaming notebook with a metal case that can be easily overclocked. Through various settings in the BIOS, the Intel CPU and the RAM can be overclocked. Moreover, a pre-installed app allows to overclock the GTX 1070 graphics card from Nvidia. The gaming notebook from Medion has a 17.3-inch, matte, LED backlight display with IPS technology. The resolution is 1,920 x 1,080 pixels, which corresponds to Full HD. The viewing angles are very good and the screen content can be viewed loss-free from almost any angle. The average illumination is very good 373 cd/m² and the pixel density is 127 PPI. In addition to the Intel Core i7-7820HK, the notebook also includes a Nvidia Geforce GTX 1070 with 8 GB of VRAM. It is based on the Nvidia Pascal architecture and also provides optimal conditions for virtual reality. The Intel CPU, an offshoot of the Kaby Lake architecture (7th generation), operates at a base clock of 2.9 GHz. Through hyper-threading individual CPU cores reach up to 3.9 GHz. The built-in CPU from Intel can also be easily overclocked. This requires manual intervention in the BIOS or Medion App. This model also has 32 GB of DDR4 RAM built in. The Windows 10 operating system is installed on a 512 GB SSD module. In delivery state, there are 422 GB available. This M.2 module achieved transfer rates of over 3,300 MB/s (measured with Crystal Diskmark 5.2.2). When writing, the SSD module is much slower. At around 1,500 MB/s, it is still fast. In addition, Medion has also built a hard drive, with a storage capacity of 2 TB in this model. The Medion Erazer X7857 gaming notebook has a large QWERTY keyboard with a separate numeric keypad. The keys have a good size and a very good stroke. In the front of the palm rest, there is a touchpad with two dedicated mouse replacement buttons. As a special highlight, a colored backlight can be switched on. It does not only glow in one color. The user can set different lighting effects in the software. There are many ports on the sides of the gaming notebook. On the left side, there are three USB sockets (Type A and Type C with Thunderbolt support). External monitors can be controlled via HDMI, Displayport, or the aforementioned USB Type C socket. That means a user can play on three monitors at the same time. On the right, Medion has two other type A USB sockets, the card reader for SD cards, the RJ-45 socket and the connections for the headset included. The gaming notebook lacks an optical drive. The network connection can either be wireless via WLAN (ac standard) or wired via the RJ-45 socket (GBit-LAN). The 6 cell battery of the gaming notebook is sufficient for about 5 hours (office/surfing). 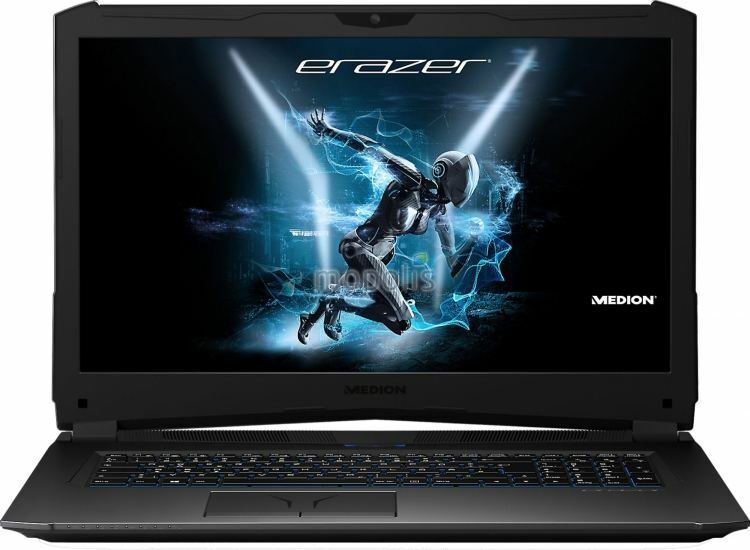 The Medion Erazer X7857 is a proper gaming laptop with specs good enough to play most games at their highest settings. However, the Full-HD resolution is a let down as users would expect a QHD or UHD resolution in a laptop like this.